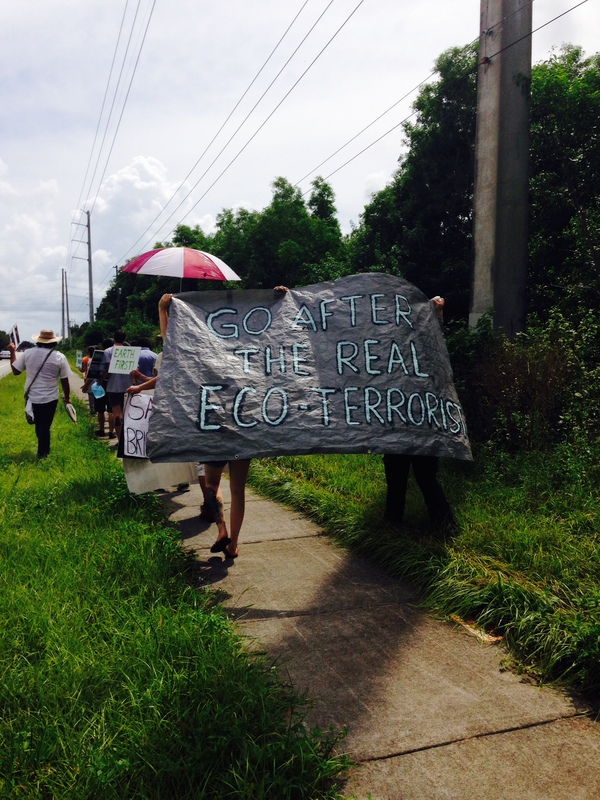 On the morning of April 11th, Everglades Earth First! 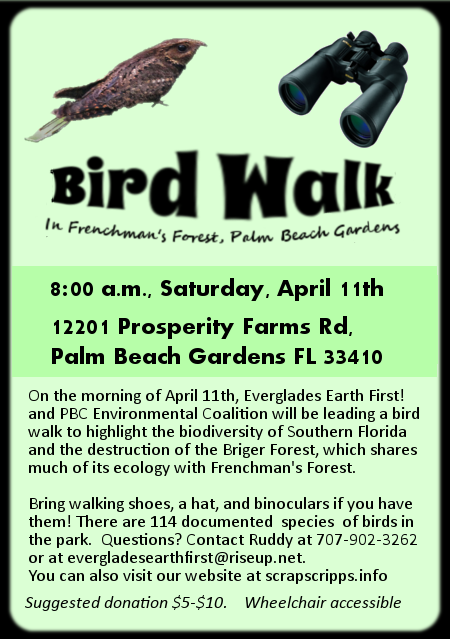 and the Palm Beach County Environmental Coalition Will be leading a bird walk to highlight the biodiversity or Southern Florida and the destruction of the Briger Forest, which shares much of its ecology with Frenchman’s Forest. Bring walking shoes, a hat, and binoculars, if you have them! There are 114 documented species of birds in the park. Bring walking shoes, a hat, and binoculars, if you have them! There are 114 documented species of birds in the park. Questions: contact Ruddy at (707) 902-3262 or evergladesearthfirsATriseupDOTnet. You can visit our website at scrappsscripps.info for more info on the campaign. Sept 12, 2014 at 10 a.m.
Everglades Earth First! will be gathering to protest the destruction of The Briger Forest located in Palm beach Gardens, Florida and the creation of animal testing laboratories. This protest is being held during the National Weekend of Action Against the Animal Enterprise Terrorism Act (AETA) a nationwide weekend of workshops, protests and educational events intended to bring attention to the AETA. The AETA is a piece of corrupt legislation that essentially redefines all action and speech in defense of animals “terrorism.” The AETA threatens the free speech rights of every US citizen, and the ability for activists to create real change in defense of animals and the earth. The Briger Forest is a 681-acre mix of freshwater marshes, hardwood forest and prairie that’s slated to become a commercial/residential offshoot of the Scripps biomedical research campus. It is home to the gopher tortoise, wood stork, the snowy egret and many others. We will meet at the boundary of the forest to talk about the flora and fauna that are threatened by this new project, and the ongoing fight to protect them. We will then march to Scripps’ Jupiter campus to voice our opposition to the enslavement and torture of animals in the laboratories slated for construction, and to show our respect for the animals already trapped within Scripps’ walls.